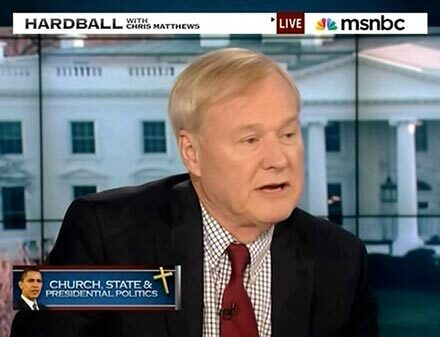 Even Chris Matthews, who famously gushed about the "thrill" Barack Obama gave his leg, is troubled by the President's "frightening" decision to force Catholic charities to provide birth control through health care. Discussing the issue on Tuesday's Hardball, the host sputtered, "...How can you make the [religious] teacher pay for birth control without losing their authority, their moral authority?" Matthews took the Obama administration's decision to its logical conclusion: "If they start financing, under the law, what they are called to do, do they have any more credibility on the issue of birth control or anything else?" He added, "It's a political issue. I agree. If you can make them do it, they can't teach it anymore. I'm just asking." GEORGE WEIGEL: This has struck a kind of tribal nerve in Catholicism. Catholic Church has been beaten up for the last ten or 11 years and I think Catholics are tired of the government and others beating up on the church. That's, in my view, one of the political facts behind this rather extraordinary reaction across the Catholic spectrum. CHRIS MATTHEWS: See, to me, I mean, certainly every woman I know has a view on this strongly, because women should have a right to make decisions, obviously. Men make them. Women should make them with equal power and equal rights. Obviously, that's not the issue. If I thought that was the issue, I wouldn't be, sort of, concerned about the way this has developed. I think it's a question of the church. Here's- I guess I grew up watching movies like Becket and A Man for All Seasons and seeing the church and state go to war with each other and being told stories from the Old Testament about the Maccabees, about people, families being told you got to eat pork. The state requires you to do it. It gets to that interesting point to me, which is frightening, when the state tells the church what to do. And then the church can no longer teach. If the church teaches it's morally wrong to use birth control, how can you make the teacher pay for birth control without losing their authority, their moral authority? That's what the church is afraid of. If they start financing, under the law, what they are called to do, do they have any more credibility on the issue of birth control or anything else? That's what I think is the concern here. It's a political issue. I agree. If you can make them do it, they can't teach it anymore. I'm just asking.